All of the flavours of a pumpkin cheesecake in dip form sweetened with plenty of caramel sauce! 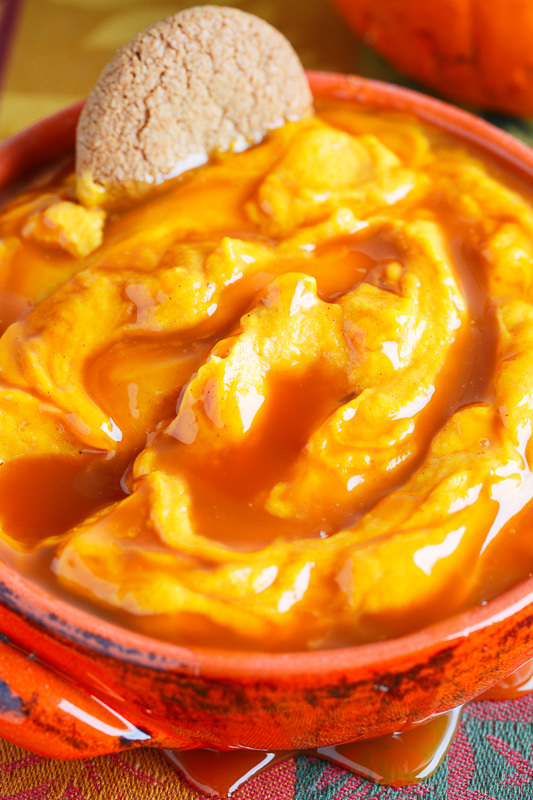 With all of the pumpkin recipes these days I could not help but think of one of my favourites, this caramel pumpkin cheesecake dip! Yes, that’s right, all of the flavours of a caramel pumpkin cheesecake in the form of a dip that literally only takes 10 minutes to make! Cheesecake has to be one of these best desserts around and it only gets better when you add the flavours of pumpkin pie but lets face it, a nice cheesecake takes a bit of time and effort to make, and this dip takes almost no effort so you can whip it up on demand whether for last minute guests or just for yourself for some late night comfort cravings! When I make a pumpkin pie or a pumpkin pie cheesecake I like to use a gingersnap crumb crust because the ginger flavour goes so well with pumpkin so when I make this dip I add that gingersnap flavour either by using the ginger snap cookies for dipping or just crumbling them on top! 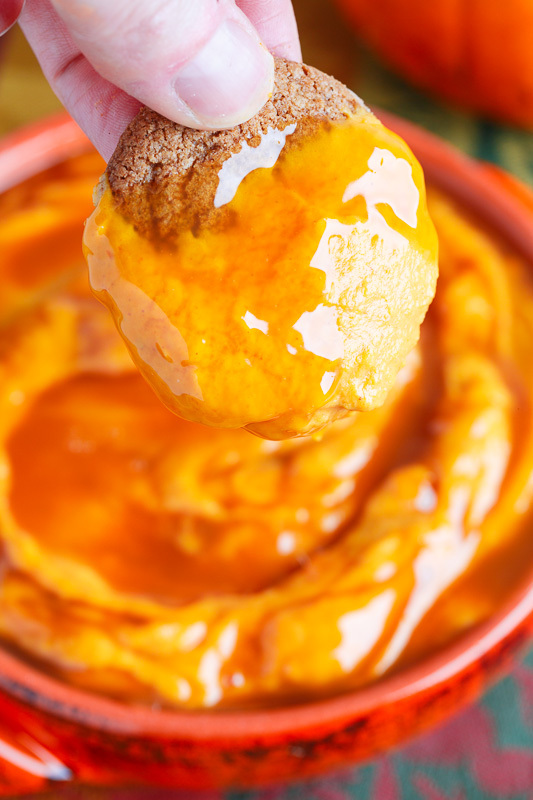 If you’re looking for a snack or appetizer for halloween or Thanksgiving, or for any time for that matter, you really can’t go wrong with this caramel pumpkin cheesecake dip! 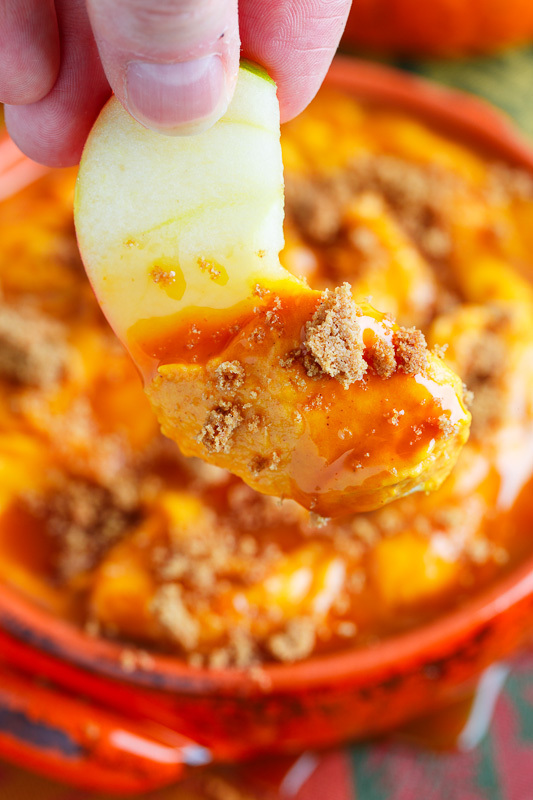 I like to serve this caramel pumpkin cheesecake dip topped with crumbled gingersnap cookies with sliced apples for dipping! It’s also great with gingersnap cookies for dipping! Serve it in a hollowed out pumpkin for even more fun! Mix everything and enjoy with gingersnap cookies, graham crackers, apple slices, etc. Option: Reduce or increase the amount of caramel sauce depending on how sweet you want it. Option: Replace the caramel sauce with 1 cup powdered sugar. Option: Top with crumbled gingersnap cookies. Wow how creative! And gingersnaps would go perfectly! I would snack on this all day on Thanksgiving! I love the idea of dipping ginger snaps. You could even serve this as dessert! 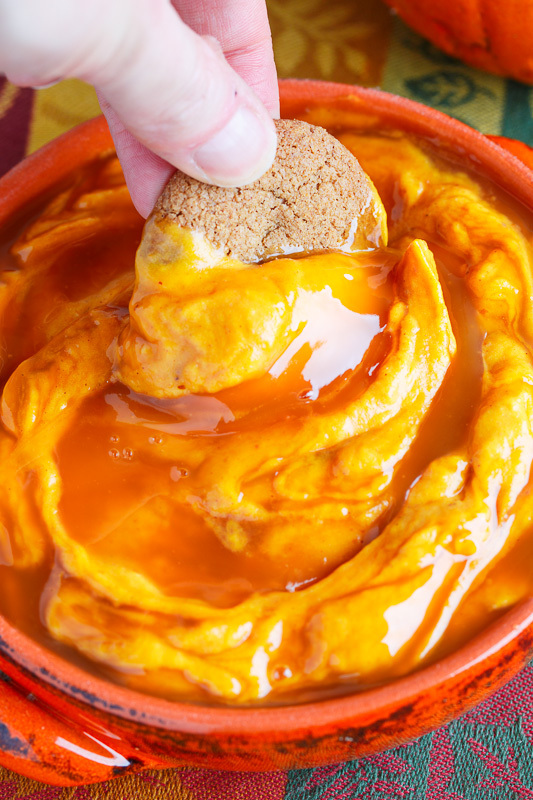 i love pumpkin anything, and this dip looks so creamy and delicious! gingersnaps and apple slices would definitely be great for dipping, but i could probably just eat it by the spoonful too! kevin! you're back! you & your funky recipes were missed my friend. 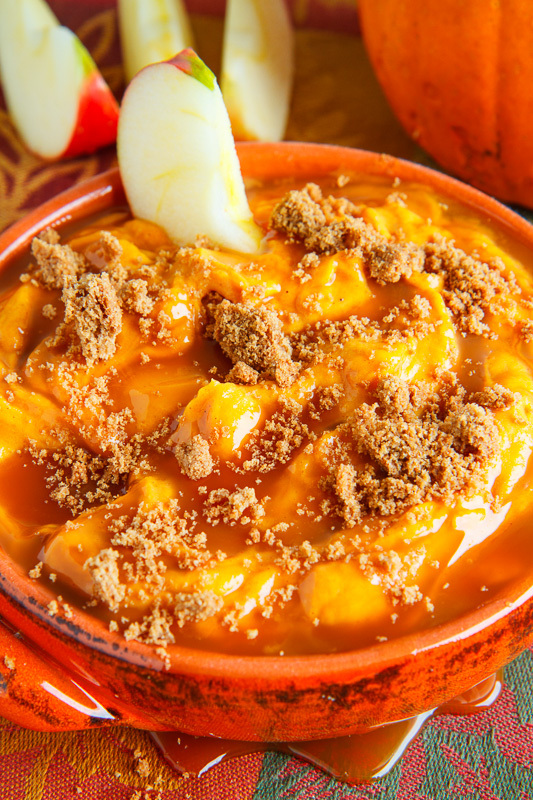 and what better way to come back than with a sweet version of pumpkin dip. you missed my creamsicle cheesecake…you have to try it out, seriously i know you'll love it. Such a great idea, and it looks great served in the little pumpkin! This is my first year actually attempting to use fresh pumpkin and making my own puree, and I love the idea of presenting the dip in a hollowed-out pumpkin! So charming, and I bet the dip goes great with ginger snaps. Sounds interesting! Pumpkin time and definitely would like to try this recipe. Thanks for sharing. Wow kevin the dip sounds interesting..and u have presented beautifully. Yum! Love the presentation and the pumpkin dip. Sounds like a wonderful combination. Great on cookies and great on bread. We've made something like this, and it was amazing on crostini. Nice! Sounds like you had a great Thanksgiving dinner starting with that pumpkin dip! Que ricas tienen que estar. Me las apunto. 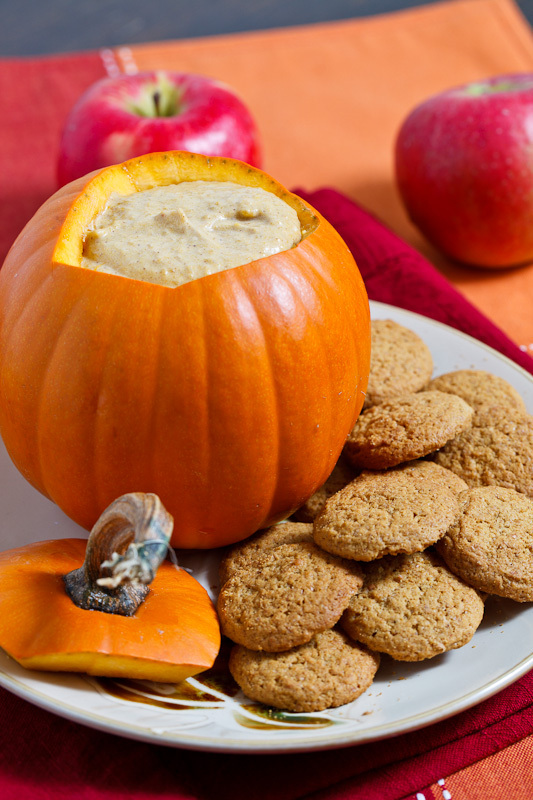 I love the pumpkin dip! I already know that my family would devour this dip (in a matter of seconds). Great idea for the upcoming holidays!!! Mmm I bet this would also be awesome smeared on a bagel! So glad you've back Kevin! Perfect for Halloween Party! Thank You for the recipe! I love the presentation for the dip! Clever and beautiful :). What a simple and delicious dip! A great idea for fall entertaining! ive never seen an orange pumpkin that small! Ooh, that sounds pretty heavenly. And you just can't beat a hallowed out pumpkin for an autumnal presentation. I may need to make this for an upcoming harvest dinner! Thanks! Thats funny because i posted this same exact thing on Facebook on October 9th. Fabulous dip! I loved how you served it!! Very cute! I bet it gets messy once you've gotten to the bottom of the pumpkin– hard to get all that goodness out :). By the way, I've added you to my blogroll. What a very clever recipe??! Pumpkin dip? To be used with gingersnaps?! Brilliant idea indeed. We are having a party at my daughter's school, so perhaps I'll try this dip! Thanks for the inspiration! My mouth watered at the sight of this! I'm so excited by fall flavours! I just made this and it's delicious! May I suggest, though, that it turns out better if you first process the cream cheese till very smooth, them cream in the sugar, then add the other ingredients. Also, if you want to reduce carbs or are out of brown sugar, you can substitute 1 C Splenda plus 2 T blackstrap molasses. This looks incredible! Especially displayed in a pumpkin! I might have to try this tonight for a pre-Halloween party! I made this yesterday! Turned out great and got a ton of compliments. Served with apples and cinnamon-sugar cookies 🙂 Thanks for posting the recipe! This is just plain amazing. We had gingersnaps and sugar cookies! I still want to try this, but I was craving something savoury the other day so I made a pumpkin dip with cream cheese and curry powder. Oh man, was that amazing! I tried out this recipe and did not enjoy it. I think it may have called for too much ginger, it did not remind me of pumpkin pie. To anyone making this, I would try out just 1/4 tsp first. Ohhh my gosh- I want to eat an entire pumpkin filled with this! Delicious! !